Craig bought me a North African and Middle Eastern recipe book for Christmas this year, I have only tried a few recipes so far but this one has been a stand out! According to the book this is the kind of dish that is sold at bus and train stations throughout North Africa and the Middle East. It is cooked on the spot and eaten straight from the pan. Its a really easy dish to make and the only item that is hard to find is a Moroccan spice blend called ras el hanout. I found it online from spice bazaar and it cost me $4 for a pack. Sounds expensive but you only use one teaspoon. I have made it about five times and haven’t used half the pack yet. Because ras el hanout is a mixture of many different spices there isn’t really an easy way to replace it with something else (unless you make it up yourself). 1. In a bowl, knead the minced lamb with onions, breadcrumbs, one egg, cinnamon, chopped parsley and salt and pepper until well mixed. Lift the mixture in your hand and slap it down into the bowl several times. 2. Take a small amount of mixture and shape it into a small ball, about the size of a walnut. Repeat with the remaining mixture to make about 12 balls. 3. Heat the olive oil in a large heavy frying pan. 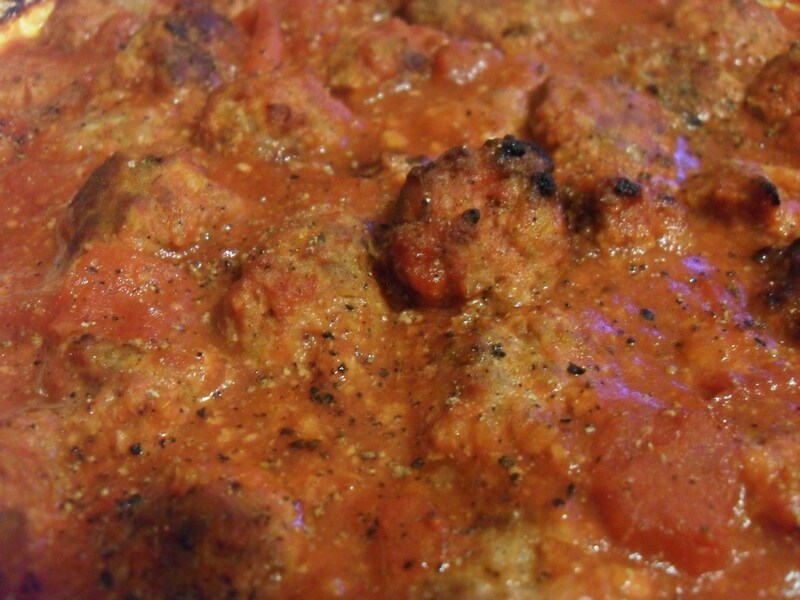 fry the meatballs until nicely browned. Turning them occasionally so they cook evenly. 4. Stir the tomatoes, sugar, ras el hanout and most of the chopped coriander into the pan. Bring to the boil, cook for a few minutes to reduce the liquid and roll the balls around in the sauce. Season to taste with salt and pepper. 5. 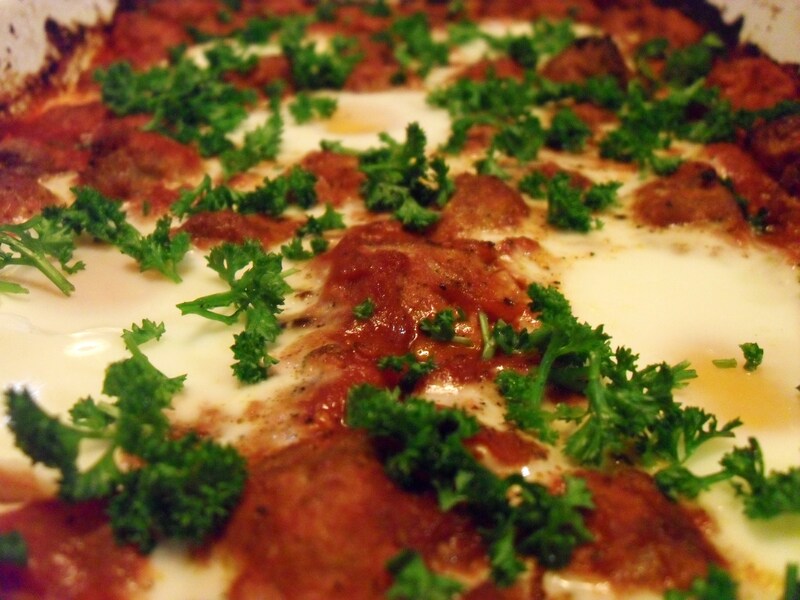 Make room in the pan for the remaining eggs in the pan and crack them into the spaces between the meatballs. 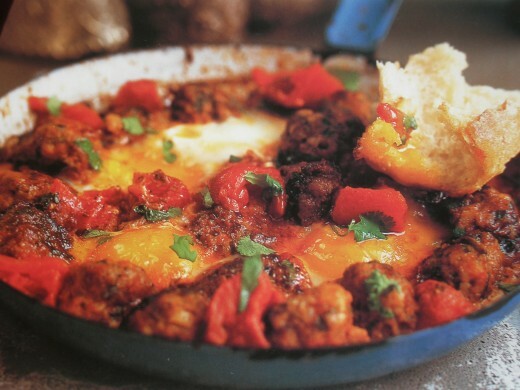 Cover the pan, reduce the heat and cook for about three minutes, or until the eggs are just set. 6. Sprinkle with the remaining chopped coriander and serve in the pan with chunks of bread to use as scoops. Note: I didn’t have any fresh coriander, and no time to get any so I just used a little extra parsley and added half a teaspoon of ground coriander into the sauce. Also I was making it for a large family dinner and so I tripled the recipe, and cooked it in a large casserole dish. 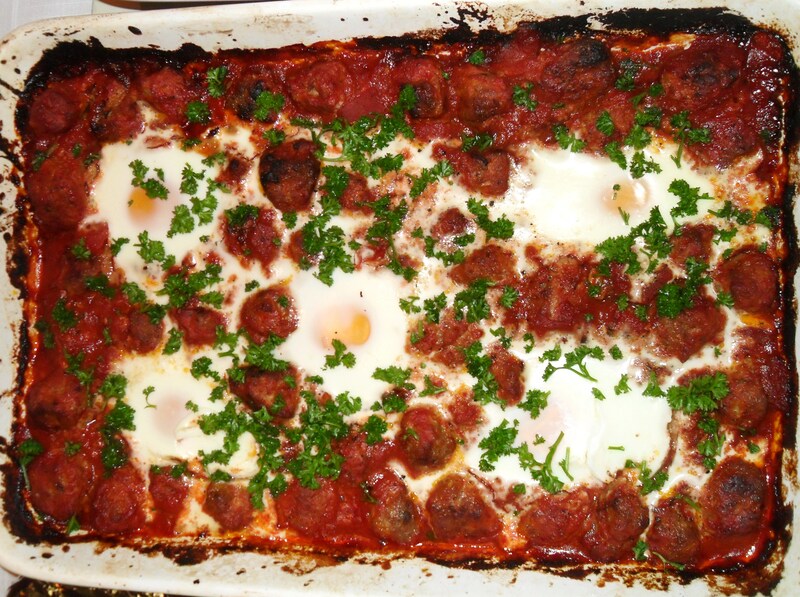 Which meant that after I cooked the meatballs in the pan I combined it all in the casserole dish and put it in the oven at 200C, the eggs took about 5-8 minutes to cook in the oven.